Reclaim Open Learning: ds106 is winning! The open learning innovation contest invites innovators whose work embodies the principles of connected learning to submit their stories and experiences for consideration. They might be running online or offline courses, activities, learning programs, study groups, or hybrid classes or out-of-school (extra-institutional) activities having to do with independent learning and volunteer work. ds106 is a pretty compelling example of a connected learning environment, so it’s pretty cool that the course-turned-commuity got some recognition as well as funding—in the form of a $2000 honorarium. The funding will serve to support the awesome work Martha and Alan have done building the ds106 framework out. We’re hoping over the next year we can take some of the ds106 pieces like the assignment bank, Daily Create, a syndication hub, and feed reader and provide them as plugins, themes, and/or stand-alone, open source applications. This is the larger vision behind Reclaim Your Domain that Audrey Watters, Kin Lane and I started knocking around almost five months ago (a conversation we’re about to return to at Minding the Future next month). For me, this is a sign that the persistence of a vision around syndication, supporting faculty, and empowering students might be paying off. And when I see the awesome thought experiments of people like Martin Hawksey in the rich tradition of Tony Hirst, I’m sure there is still something great in all this syndication nonsense. What’s more, the work I’ve been doing with Howard Rheingold developing an open source course environment encourages me all the more. Faculty can take control of their course environments with relative ease even now, but if a community of us got together with some funding to make the process that much more seamless, that would be the culmination of years of work so many of us have labored over. It’s by no means the end of that work, but I strongly beleive making this stuff simple enough that good faculty and students who want to do it can would make a huge push towards reaching critical mass with a framwork that is actually innovative—and moving it all to another level. This will be my work over the next year or two, and it really starts with OpenVA. I want to see if we can’t get critical mass, some serious funding, and the freedom to bring a bunch of people together and start experimenting with what it might mean to build a framwork that allows faculty and students alike to become their own node and hub on the web at once. It would require robust syndication, an array of API integration, cheap hosting/domains (hello Reclaim Hosting), and a collaborative community that is just as focused on making the framework easy as it is developing faculty in an extra-institutional fervor of “free culture” maniacs. Where can I find such a model? This entry was posted in digital storytelling, Uncategorized and tagged ds106, reclaimopen. Bookmark the permalink. 4 Responses to Reclaim Open Learning: ds106 is winning! Congrats to the DS106 crew. I’m very excited for this semester! We are discussing the elements of a great online course together with Dr. Mills of Harvard University at E-Learning Perspectives (www.elpx.org) and would love your feedback. 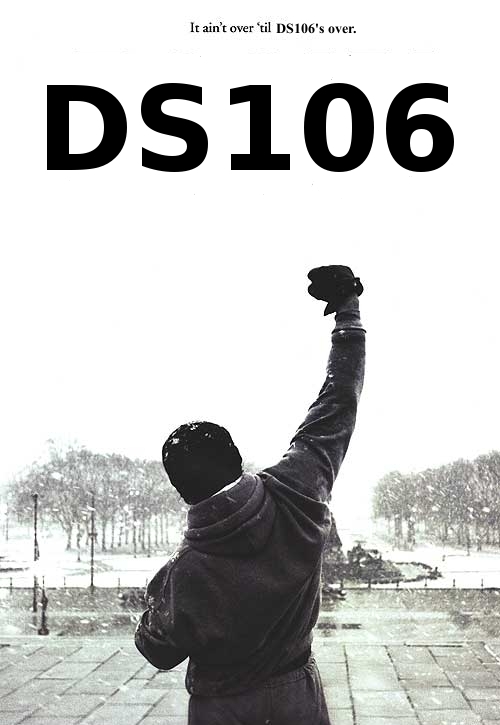 I stumbled across ds106 while participating in #edcmooc earlier this year and was thrilled when the #headless106 option was offered this fall. I am delighted to be part of this dynamic, creative, collaborative community and look forward to supporting the work of the #ds106 crew. The passion that you, Alan and Martha (and others) bring to the community is contagious!